What sort of safari vehicle can you expect on your safari? When you go on safari as part of a group you will find that you almost always have a vehicle to yourselves, for exclusive use of your group only. When you travel alone, or as a couple, you will usually find that you are sharing your transport with other people. How might this affect your safari? In some cases it won’t have any noticeable effect but in others the effect can be significant. To see how this might affect your safari we need to look at the types of vehicle that are used and the type of journey you will be making. There are 3 main types of vehicle you will come across in the course of your safari. While this type of vehicle is perfectly adequate for road transfers, we cannot recommend them as game drive vehicles and, although you might see lots of them in busy reserves like Amboseli and Masai Mara, we will not use them as such. 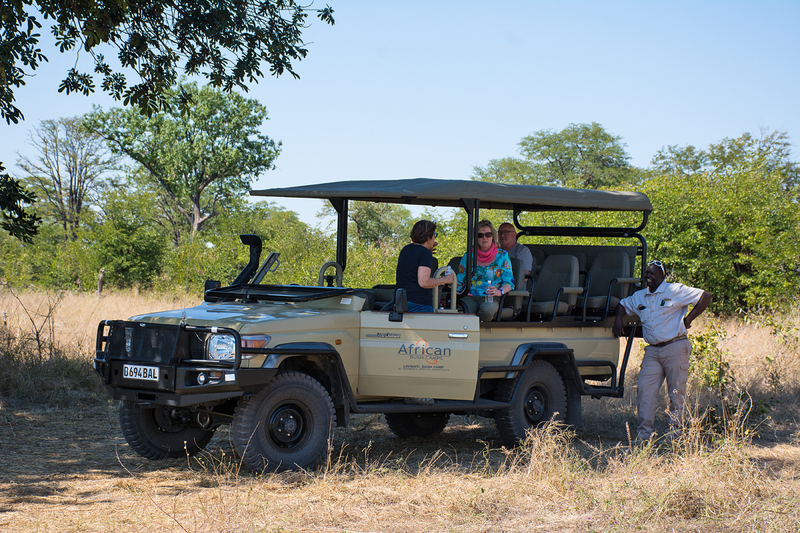 If you will be using the same vehicle throughout your safari, both for transfers between game reserves and for game drives within the reserve, it is likely that this will be the style of vehicle you are going to get. In this case your driver will also be your guide. These vehicles are a compromise. Most of the game viewing will be done by standing up and using a roof hatch that remains closed for road travel. If there are just a few people in the vehicle, say 4, this is OK, but it is far from ideal if several people are trying to move around and take photos at the same time. A lot of lodges and camps maintain their own vehicles and have their own guides. Because their vehicles are only used within the game reserve they do not need to meet the same road safety standards and can be designed with game viewing as their sole purpose. The big advantage of these vehicles is that they are open on all sides; the roof is also usually removable, which means that passengers have excellent all round visibility. By this we mean transfers from the airport on arrival to the hotel where you’ll be staying your first night and any similar transfers in the course of your itinerary. If there are other people travelling between the same two points as you are, you will quite likely find yourself sharing these journeys; and in most cases it has minimal impact on your enjoyment. In the course of your safari you may need to travel by road between game reserves; either because there are no airstrips, for reasons of cost or perhaps because driving will give you the chance to see more of the country and meet local people. If you are the only people making this journey you may well have a vehicle to yourself but if there are others on the same route you will almost certainly share. Once again; since this is a point to point journey as long as everyone is comfortable this should not detract from your enjoyment. In many cases this is absolutely fine and is a great way to meet and get to know other guests. However there are occasions when this will not suit your needs. Not everyone checks in and out of camps on the same day. So you will often find that your fellow passengers change – sometimes on a daily basis. Whilst you get to meet more people the guide will have a responsibility to ensure that all his clients see as much as possible. So; if you spent yesterday watching a pride of lions with cubs and are looking forward to seeing something different today but new people in your vehicle have not yet seen the lions, chances are your guide will go back to the lions. He’ll want to give his new passengers a good sighting on their first game drive. He won’t risk leaving it for a day in case they move and cannot be re-located. Another thing that may hamper your enjoyment is that it is unlikely that everyone in the vehicle will be as keen on photography as you are. Whilst you want to spend as much time as necessary with the sightings and wait for the right moment to take your photos there will be others who simply want to see as many species as possible and will want to take a quick photo and then move on. It is all too common on game drives for people to be obsessed with seeing the so called Big 5 and to take little interest in lesser species and even less in birdlife. This can be extremely frustrating and is one of the most common causes for complaint on game drives. The obvious solution is to book a private vehicle and guide for your game drives. Unfortunately, as you might expect, this costs extra. Depending on the camp, the season and the demand, a private vehicle can cost between $150-$500 per day extra. This extra cost is significant, especially when added to the cost of an already expensive safari and, understandably, most people are reluctant to pay it. In our opinion however, it is worth trying to find accommodation at a slightly lower price and splashing out on a private vehicle. A bed is just a bed, but a private vehicle and guide can transform a good safari into a great one. If you are concerned that game drives in a shared vehicle may lead to problems but find the additional cost of a private vehicle prohibitive what can you do about it? Most safaris will combine visits to more than one game reserve. One option is to book a private vehicle for the duration of your stay in one reserve only. Alternatively, some people will try to book a private vehicle for just one day of their stay in a particular reserve. There are merits to this. After you’ve shared a vehicle for the first couple of days and have a feel for the reserve and where the best photo opportunities are, enjoy your last day in a Private Vehicle where you can choose where to go and how long to stay. Be aware though that you cannot expect the camp to have a spare guide and vehicle standing by ‘just in case’ someone wants them. You will need to book well in advance to secure this service and even then some camps will not want to accommodate this request. If you travel at the busiest time, when camps are fully booked, you will almost certainly find yourself travelling in a full vehicle on game drives. If you can, choose to travel outside peak season when camps are less likely to be full and you’ll have a much better chance of find yourselves as the only occupants of your game vehicle. In low season some camps might even let you have a private vehicle at no extra cost. That’s not the only advantage. Outside peak season there will be fewer vehicles going out on game drives so your sightings are less likely to be spoiled. And, best of all, your safari will cost you less as well.